When soul legends The Real Thing call in at The Apex on 15 September, they will be celebrating almost 50 years in the music business. The original vocalists, Chris Amoo and Dave Smith return to perform all their million-selling hits and many other soul and funk classics. Founded in 1970 by Chris Amoo, Dave Smith, Kenny Davis and Ray Lake, The Real Thing's soul-influenced covers of American hits attracted enough attention for them to secure a recording deal with EMI. They appeared on TV talent show Opportunity Knocks and their career took off when they collaborated with David Essex and Pye Records. They toured internationally with Essex and recorded a number of popular songs (though none were big sellers). Chris Amoo's brother Eddie, who had sung with the Chants, joined the group and the pair started writing songs that had real hit potential. In 1976 their debut album Real Thing was followed by a string of hits including: ‘You to Me Are Everything’, ‘Can’t Get By Without You’, ‘Can You Feel the Force?’, ‘Whenever You Want My Love’, ‘You'll Never Know What You're Missing’ and ‘Children Of The Ghetto’. ‘Children Of The Ghetto’ has been covered by artistes as diverse as Phillip Bailey (of Earth, Wind and Fire) on the Chinese Wall album, Courtney Pine on his Journey To The Urge Within album and The Swingle Singers Live At Ronnie Scott’s. The song was also featured in the Spike Lee movie ‘Clockers’. In 1986 “You To Me Are Everything”, “Can’t Get By Without You” and “Can You Feel The Force” were all remixed and became top-ten hits again, thanks to their huge club following. In 2005, ‘Love's Such a Wonderful Thing’ was sampled by French dance outfit Daft Punk and re-titled ‘So Much Love to Give’. The same year the Freeloaders had a UK Top 10 single with ‘So Much Love to Give’ which featured The Real Thing, resulting in the band charting across 3 decades. Following the sad passing of Eddy Amoo in February this year, Chris Amoo and Dave Smith have decided to continue as a duo, backed by their 5-piece, The Real Thing Band. Chris said: "The fans' outpouring of support makes us realise how much love there is out there for The Real Thing, and we're doing this for them, and for Eddy, who was the greatest showman. It would have been Eddy's wish for us to carry on and still feel the force." (Liverpool Echo). The Real Thing concert at The Apex on Saturday 15 September starts at 7.30pm. 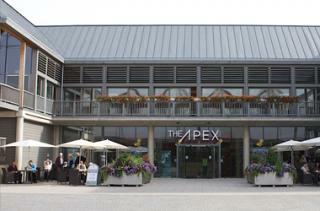 Tickets are £22.50, ring the box office on 01284 758000 or see the website - www.theapex.co.uk for details.